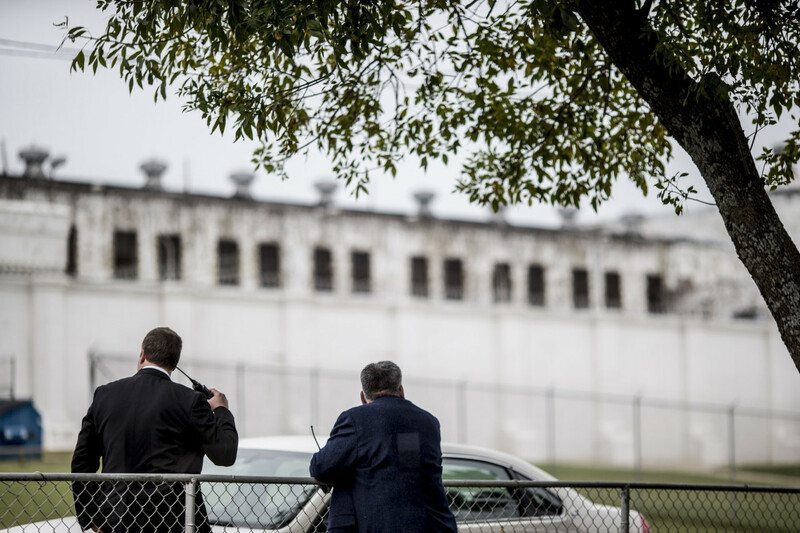 Oklahoma Department of Corrections employees stand guard outside the media center at the Oklahoma State Penitentiary in McAlester, Oklahoma on the day of Richard Glossip's execution. McALESTER— Richard Glossip had eaten his second last meal and was watching television news Wednesday to figure out why he wasn’t dead yet. Outside the white walls of the Oklahoma State Penitentiary, Glossip’s family and friends thought he was already dead. Reporters heard them crying out in anguish when they learned the Supreme Court had denied Glossip’s request for a stay. It turned out Oklahoma didn’t have the right lethal drug to carry out the last step of his execution. Instead of potassium chloride, which stops the heart, the prison had potassium acetate. Glossip has had four stays of execution, including on Sept. 16, the day he was to be put to death. The stay on Wednesday “is the most stressful it has been.” He had been moved to a holding cell and was not taken into the death chamber. “I’m sitting there watching TV trying to keep up with the news and find out what’s going on,” he said. Glossip has 37 more days to live based on Gov. Mary Fallin’s stay, issued Wednesday. Earlier in the day, his attorneys said they asked the governor to give them 60 days to make a new clemency plea to the state Pardon and Parole Board. Shortly before Glossip’s 3 p.m. scheduled execution, the U.S. Supreme Court denied his request for a stay and declined to hear his new claims of innocence. About 3:45 p.m., a prison spokesman told about 30 journalists gathered in the media center the execution was off. In a terse statement to reporters, DOC Director Robert Patton said he had visited with the family of Barry Van Treese. Glossip was convicted of first-degree murder in the 1997 killing of Van Treese, who owned the Oklahoma City motel where Glossip worked. Van Treese was beaten to death with a baseball bat by Justin Sneed, who testified Glossip paid him to carry out the killing. Patton announced the execution couldn’t begin as planned, but said little else before rushing out of the room without taking questions. A spokeswoman said she hoped to have more information soon on the drug mixup. Oklahoma changed its protocol in the wake of the April 2014 botched execution of Clayton Lockett, in which an IV was improperly inserted. Lockett died on the gurney 43 minutes after his execution began. The state’s announcement it had received potassium acetate instead of potassium chloride raised questions about when prison officials knew they had the wrong drug. David Kroll, a pharmacologist and medical writer, said the drugs are “two different chemicals.” But they would function similarly to stop the heart, he said. “They are roughly equally toxic to rodents,” Kroll said. The similarities between the drugs raises the question of whether the state simply couldn’t obtain potassium chloride, which is part of its protocol, and substituted potassium acetate. Prison officials notified Glossip’s attorneys in August they would use the three-drug combination that includes potassium chloride. Prison officials said Wednesday that two other executions scheduled for October were still scheduled to take place. Benjamin Cole is scheduled to be executed Oct. 7, while John Marion Grant is set to die Oct. 28. Dale Baich, the attorney who represented Glossip and other death row inmates in a challenge to Oklahoma’s lethal injection drug protocol, said state officials had not told attorneys they planned to use a different drug from potassium chloride. When asked if he trusted the Department of Corrections to fully investigate the drug mixup, Baich said he had no comment. “Oklahoma once again realized something was wrong. Oklahoma has had months to prepare for this execution, and today’s events only highlight how more transparency and public oversight in executions is sorely needed,” he said. The fact that Glossip’s execution was stayed 37 days — an unusual number — was not explained. However, the Nov. 6 date is after a new state law takes effect allowing inmates to be put to death with nitrogen gas if other methods are unavailable. Ziva Branstter, Cary Aspinwall and Shane Bevel are journalists from The Frontier, a Tulsa-based online publication.